There are no two office removals alike, as each office relocation project presents its own special considerations and challenges to overcome. If you are on the verge of your first office removal, or you simply don’t have the time or means to deal with such an elaborate project, then contact Gunnersbury Office Removals and put yourself one step closer to a successful office relocation. Professional office removals have long been our specialty and we have taken every bit of care and effort to provide our customers with genuinely good office removal solutions that are really worth it. We understand that cost efficiency is crucial for successful office relocation and failing to project and account for costs properly can leave owners stranded halfway with no money to spare. This is definitely not a good scenario, but, with us, you will have no such issues, as we can expertly plan and organise your entire office relocation in a way that saves you resources and leaves you with spare money. We understand that suitable timing is another essential factor of successful office removals, therefore we will schedule and carry out the relocation in a suitable, off peak time, and make the process even swifter and more manageable for you and your staff. Timely completion of the removal is a must, as failing to meet certain deadlines or allowing for other costly delays is totally unacceptable. We guarantee to have everything wrapped up and ready to go within the specified time. Avoiding costly delays and allowing for timely completion will also reduce your business downtime, which translates to fewer lost profits. Our aim is to have you settled and ready for work at your new address, within the shortest time possible and with minimum disruption to your staff duties. Safe handling and damage-free transportation are vital for our customers therefore we will take every bit of care, and be extra careful when packing, securing and loading of your office contents. Gunnersbury Office Removals works with dedicated, seasoned moving professionals, who know their work inside out. Many things can go wrong during a professional office removal in Gunnersbury W4 but we, from Official Removals, will not let that happen to you. Hire us and we guarantee that your items and furniture will not be lost, damaged or even scratched since we have secure moving vans and trucks. Also, we offer a full insurance coverage and we work with some of the most thorough and detail-oriented movers in W4 Gunnersbury. We are able to offer you incredible benefits, including complimentary no-obligation quotes, reliable packing and a custom-tailored business relocation solution. 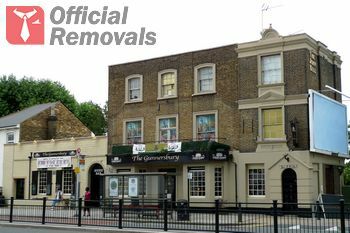 Our trusted office removal services in W4 are moderately priced. Gunnersbury is a sitting in the London Borough of Hounslow. A small part of it is also set in the Borough of Ealing. A popular tourist spot in the area is Gunnersbury Park and Museum. The site and the properties on it were once owned by the wealthy Rothschild family.